You don’t have to worry about an Internet connection, or virus software, or what DNS, IP, NAT, or any other jargon means. All you have to do is connect MailBug to your phone line and let it do all the work for you. It’s so much simpler than setting up a complex and expensive in-home network. In fact, it’s so simple that all you really need to do is read your incoming mail and write your outgoing mail. That’s it. Easy. Finally. … and MailBug displays your email mailbox (as shown below). Select a message and press the “Read” button (above), and MailBug displays the message for you. From there you can read it, reply to it, forward it, or delete it (as shown below). Messages can be short or long. Just scroll to read. MailBug even handles messages that are very long, as long as four 8 1/2 typewritten pages. MailBug will store 100 names and email addresses for you, making composition of new messages simple and fast. 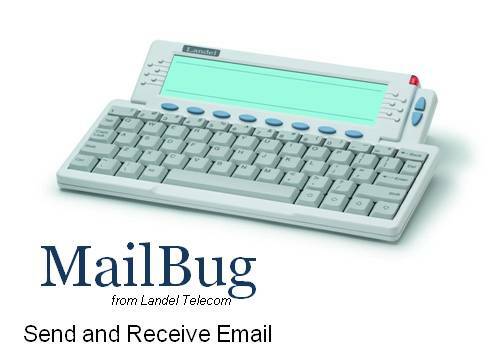 MailBug has full-sized keys for easy typing, and a backlight bright enough to let you read email in the dark. Whether sending or receiving messages, email has never been easier.